Australia’s ambassador Chris Cannan joined ambassadors diplomats from across the world at President Reuven Rivlin’s residence in Jerusalem to celebrate Israel’s 70th Independence Day. Also participating in the event were Prime Minister and Minister of Foreign Affairs, Benjamin Netanyahu and his wife, Mrs. Sara Netanyahu. Prime Minister Benjamin Netanyahu said: “There are two things that you can do to help Israel celebrate this great Independence Day. The first thing is – speak out against Iran. Iran is the enemy of us all – of Israel, the Arab world, Civilization. It openly speaks today, 2018, the 21st century, it openly speaks about liquidating Israel, openly! It encircles the whole Middle East which it wants to conquer, it fires rockets into Riyadh and Saudi Arabia, it is occupying Lebanon effectively, it’s trying to inflame Gaza again, it is in Iraq, and it is trying to establish a military base in Syria, which all peace-loving nations should resist, speak out against Iran. If history has taught us anything, it is that a murderous tyranny must be opposed in the beginning. Stop bad things in the beginning. The second thing you can do to advance peace is to move your embassy here. We are delighted with President Trump’s decision to move the embassy here. It says a simple thing: Peace must be based on truth. Recognising reality is the way you build peace. You cannot build peace on a foundation of lies because it crashes on the rocks of reality. It’s important to establish those principles that will ultimately guide peace: that Israel has a capital, that the Jewish people have had a capital for 3,000 years and that it’s called Jerusalem – is uncontestable. It’s time to recognize that fact. I’m delighted to say that there are at least half a dozen countries that are now seriously discussing with us, moving the embassy to Jerusalem, and thank you Guatemala for doing that. There will be others to follow. This week, the modern state of Israel will turn 70 years young. Israel’s transformation into a dynamic and prosperous nation with a strong democracy continues to prosper. Long it may do so. 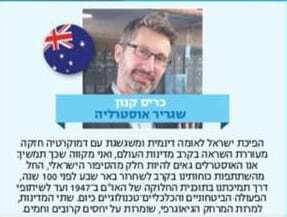 We Australians are proud to be a part of Israel’s story. From the Battle of Beersheba a hundred years ago to our support to the UN Partition Plan in 1947, to our defence and hi-tech cooperation today, Australia has been a strong supporter and friend of Israel from the beginning. Our two countries may be geographically distant but our relationship is only getting closer. Happy Birthday, Israel! L’Chaim!